Thomas B. 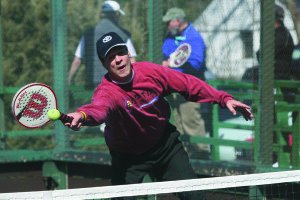 (Tim) McAvoy had platform tennis hard-wired into his genes as his mother, Lucie Bel McAvoy, was a pioneer of the game in the greater Philadelphia area and a Hall of Fame inductee in 1992. 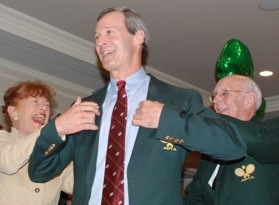 McAvoy, a seven-time National Champion, made exceptional contributions to the game in Region III as well as to the APTA where he served as President from 2009-2012. McAvoy won two Mixed Nationals with Diane Straus Tucker in 1993 and 1994 and five Senior Nationals – with John Adams (45+ in 2004), with his cousin Scott Bondurant1(50+ in 2009 and 2010), with Diane Straus Tucker (Mixed 50+ in 2009) and with Laurie McAvoy Hissey (Mixed 50+ in 2013). He was a finalist in the 2006 Mixed Nationals, the 2005 and 2007 Men’s 45+, the 2008 and 2012 Men’s 50+, and the 2012 Mixed 50+. The finals appearances in 2012 were all the more remarkable as Tim had beaten non-Hodgkins Lymphoma. He also won more than 20 President Cup Qualifier Tournaments including a stunning 14 Pennsylvania State Championships, and led Region III to eight President’s Cup titles (along side Reb Speare, John Adams and John Stefanik). While Tim’s playing record was impressive he was also made enormous contributions to the game as Region III President where he had a major role in the growth of the game, and to the APTA where he served as a Board member for nine years and as the 34th APTA President for three years (2009-2012). Tim was also active in National Championships, starting with the 1992 Nationals in Long Island and another three in Philadelphia. 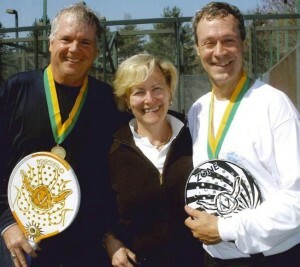 However, the tournament that most embodied his commitment to family and the game was the Mixed MAPTA championships that he won nine times out of a total of 19 final appearances with his mother or his sister, Laurie McAvoy Hissey, as his partner.Tim’s commitment to family was first and foremost, but paddle was close behind. During his tenure as APTA President, McAvoy focused on growing the game, and he created a task-focused Board Committee structure, so every key APTA initiative was led by a Committee Chair who championed that initiative. This structure allowed every Board member to be actively engaged in, and focused on, an area of their interest. These committees addressed issues ranging from growing the game, to rules, to seniors, branding, Platform Tennis Magazine, and more. Under Tim’s leadership, the APTA Board provided more than $150,000 to the Grow the Game Committee to provide grants so facilities could get new courts or improve existing ones, while the Clinic and Exhibition Committee provided more than 10 free clinics and exhibitions a year in areas where the APTA felt they would have the biggest impact in growing local programs. Communities and cities such as Arapahoe, Kansas City, Toronto, and the University of North Carolina at Chapel Hill benefitted from these clinics. 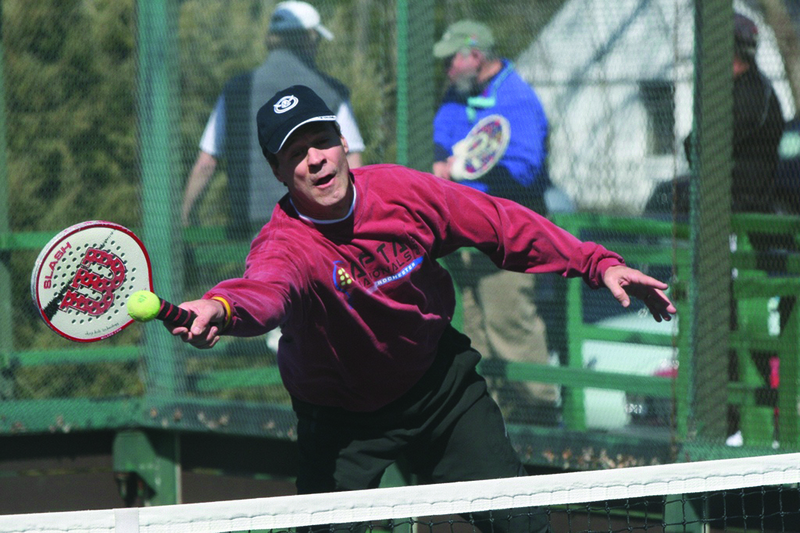 Thousands of local players were treated to Professional Platform Tennis Association pros giving free instruction and displaying amazing talent in exhibitions, with the sole purpose of trying to help local facilities grow the game in their area. In all these roles Tim’s leadership style was characterized by the strong relationships he developed with people, whether they were tournament or league organizers, teaching pros, fellow Board members, or players of all abilities, sexes and ages. In 2009, McAvoy transitioned the Viking Junior Tour into the APTA Junior Tour, a program that offered young players more than 14 different junior tournaments, culminating in the Junior National Championships held each January. Hundreds of children and teens participated in these events each year, with the Junior Nationals drawing more than 200 participants. Tim believed that exposing children to a fun platform tennis experience increased the odds that they would come back to the game after college, and that this approach was a strategic way to grow the game for generations to come. Another important commitment made by the APTA Board under Tim’s leadership was the development, in early 2012, of a computer-based interclub league system that would allow APTA member leagues to schedule, track results, and share information free of charge. Modest, energetic, determined, and positive are all adjectives commonly used to describe him. On the court he brought a positive attitude and great sportsmanship and was considered a wonderfully supportive partner who could raise the team’s level of play by blending his style of play to that of his partner’s. He knew that the game was about camaraderie, community & competition. His dual commitment to family and platform tennis even came through in his choice of life partner. He met his future wife and mother of their four children, Nancy, on St Patrick’s day in a Toronto bar where Tim had gone for drinks after a paddle game and Nancy had gone to celebrate with some friends. Nancy turned out to be a huge fan of the game and that was that. Before devoting time to care for Tim during his battle with cancer Nancy had attended 20 straight Nationals. It is no wonder, then that their son Tom was a finalist in the 14-and-under in 2003 with, of course, his cousin Peter Hissey. It’s all in the genes. 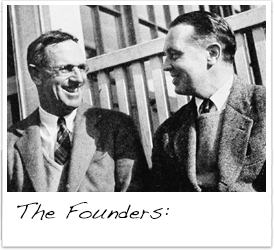 McAvoy was born in Phoenixville, PA, home of the family enterprise that began in 1896 when his grandfather,Thomas Bell McAvoy Jr., established the McAvoy Brick Company on the banks of the Schuylkill River. He attended The Pennsylvania State University on a tennis scholarship and played #1 singles in his junior and senior years and #1 doubles in his sophomore, junior and senior years; he was team Captain in his senior year and graduated in 1980. He worked for SmithKline Beecham for many years in sales and marketing roles and then switched to the financial investment field, initially with Marvin and Palmer Associates and then with DePrince, Race & Zollo, Inc., in institutional sales capacities. Note: (1) Tim’s mother, Lucie Bel Barnes McAvoy, and Scott’s mother, Sally Barnes Bondurant, were sisters and exception tennis players at Fox Meadow Tennis Club as teenagers. 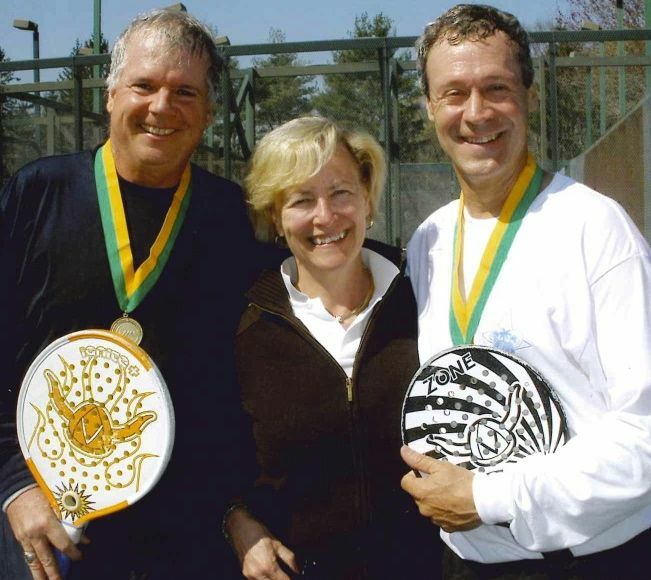 In 1982 they teamed up to win the Women’s 50+ National Grass Court Tournament at Forest Hills. Men's 2009 Senior 50+ Nationals 2010 Men's 50+ Champions. Scott Bondurant (left) and his cousin, Tim McAvoy (right). APTA Executive Director, Ann Sheedy in middle. The Championship was held at Fox Meadow Tennis Club in Scarsdale, NY where the Barnes Sisters, Scott's and Tim's mothers, were teenage tennis prodigies in the late 1940s.